I love watching the sunrise. The colors in the sky are astounding. The first light on a mountain feels so warm, and the contrasts of light and shadow are dramatic. 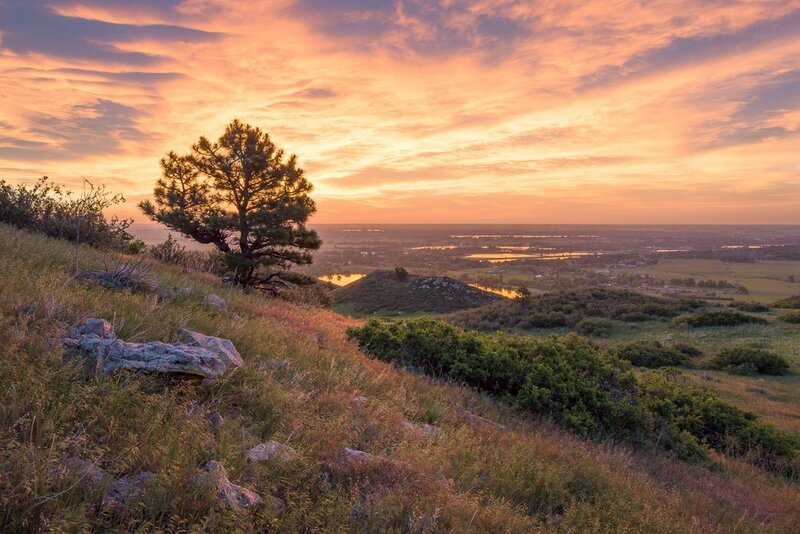 My favorite place to watch a sunrise in the Fort Collins, CO area is definitely Horsetooth Reservoir. Get up early enough, and the city can be seen below, illuminated by thousands of individual lights, high pressure sodium lamps and LEDs. It’s fun to watch the city transition from nightlife to daytime. I’ve watched many sunrises at Horsetooth Reservoir, perhaps not a hundred of them, but definitely more than ten. And each time it is spectacular. The more clouds that change color in the sky, then the more spectacular it is. Also, the first true glint of sunlight piercing over the horizon feels very magical. Of course, some mornings are better than others. It can be too cloudy, where the sun can’t be seen at all. But on any given day, I would bet that somewhere in the world there is a great sunrise. And if we could travel at the same rate that the world rotates, we’d see that sunrise is actually always occuring. It never stops. The sunrise relentlessly works its way around the earth, travelling like clockwork. About every twenty-four hours it passes the same spot again. Imagine there was a special place on earth where the sunrise was always spectacular. People would vacation there, just to watch the sunrise every morning. If they were vacationing for a week, then they could watch seven sunrises. A person who lives there could watch 365 sunrises a year. A centurion who has lived there his entire life would have seen about 36,500 of them. Also, if he would have saved a dollar a day and put it in the piggy bank, he would have about $36,500! Coincidentally, that’s about how much I have saved up for my own retirement. Assuming that our fictitious place has been on Earth for its entire history, how many amazing sunrises have occurred there? In reality, the Earth is a very dynamic place over large time scales. A very long time ago, days were actually shorter, the environments were different, and the continents were at different locations than they are now. But if our special sunrise place was there for all of earth’s history (even the inhospitable years), then there would have been approximately 1.6 trillion sunrises to watch. This represent a truly huge time scale of Earth compared to the human experience. It’s very humbling to think that if I’m lucky, I might get to experience 30,000 sunrises. And 30,000 divides into 1.6 trillion over 53 million times! But, let’s suppose that a crafty investor has lived in our special place since the beginning of the Earth. She’s been saving a dollar after every sunrise for the past 4.5 billion years. She wanted to help the US with its economic problems by contributing all $1.6 trillion toward the national debt. This amount would help a little, but she wouldn’t come close to paying off the entire national debt, which is currently estimated at $21 trillion dollars. The idea was to make a sunrise picture of a mountain called the Nokhu Craigs. This dramatic mountain is just a couple hours drive from home. It has steep contours and lights up magically with the first rays of sunlight. It had been snowing all night, but the clouds were suppose to break for sunrise. I knew that the weather was a gamble, but I decided to take the opportunity. So I woke at 2 am, threw my gear in the car, and hit the road. The drive was wintery and slow. I drove cautiously around icy curves. There was no other traffic in the early hours, except for a couple snow plows, and they are scary, because they take up both lanes and don’t stop for anything. At the trailhead, It was still very dark. The car felt comfortable and safe, but I bundled up anyway. I grabbed my gear and my tour skies, and trekked into the blackness. Even with a headlamp it was hard to see, as the light would only illuminate my own breathe and blowing snow. But eventually, the world began to brighten, a little at first, but then the headlamp was no longer needed. The mountain that I came to shoot was hidden in clouds, and I thought that there might not be a sunrise. Still, at the very least, I figured that I could make this a scouting trip. And so I skied on, searching for the view of my peak, and keeping my fingers crossed that it would break through the shrouds of clouds. But with points of reference not visible, I skied too far. I went beyond the mountain I was hoping to capture. At sunrise, the sky opened a little. The snowy ridges above me glowed dramatically from the sun, but there was no clear composition. I decided to take a few photos anyway. It was cold. Even with the daylight, the temperature was going down, and the wind was picking up. My fingers were feeling the freezing pain while fidgeting with the mechanics of my camera. They cried to be back in the mittens. So my photography time was short, and I skied back. And as I returned, I came to the view of the mountain I was hoping to shoot in the first place. It hadn’t totally emerged from the clouds, but I could see it. The scene was ever changing as the wind raked the weather across the peak. It was not the sunrise scene I had hoped, but it was moody and dynamic. Despite the sharp cold, I struggled to a higher vantage point and took my camera out again. My fingers and toes had enough of this environment, but I endured a little more to take a few photos. Then I skied back to the car, temporarily exhausted by the temperature and the effort. The result was a photo of a mountain temporarily emerging from the blowing clouds and snow. I think it’s a very dramatic photo that makes me appreciate the rugged beauty that humans are not neccessarily equipped to see. Let’s face it, beaches are more inviting to our bare skin and warm blood than cold icy craigs. However, there is still a beauty here, and I’m glad to have captured it. I will return another day, to find that sunrise scene. Scattered throughout Colorado, there are tattered remains of an era that once was. Whether it is an abandoned homestead on the plains, or an old mining operation in the hills, I am reminded of what life must have been like a century ago. For one, there were far less people. There was also less infrastructure and technology. It’s one thing to look at these old structures and be reminded of bygone eras, but it’s a deeper meditation to put ourselves in their shoes. After all, their lives were once far more real than our lives, as we were mere fantasies at that point. Their current events and politics must have seemed as passionate as today's issues, even though their problems and worldviews were different. But like today, I imagine that family was important. Some of them undoubtedly had children. They raised them out of the roost to tackle a world that's been forgotten. They must have sought friends they could trust. Long ago, these close bonds ran their course. Perhaps they had decorations on their walls and furniture they were proud to show off. And as I stare at the ruins of their home, the walls still echo their presence, like faint ghosts. If walls could speak, they could tell the stories of these folks and families. They could tell secrets about their personal tribulations and elations. Nowadays, a weekend in the mountains is a mini vacation. We ski and we hike. We fish and hunt for sport (if not survival). And we come across these old cabins and ghost towns. But, I believe that the Coloradoans from generations past had a different take on the mountains. It was often cold and harsh. Work was hard and roads still needed to be cut through the forests. But even so, perhaps a young homesteader spent his years getting up in the morning and looking at a sunrise in the same mountains that I look at today and call home. And that is our bond, two people at the same location, watching sunrises 50,000 days apart from each other. Landscape photography when conditions aren't great. In Colorado, as is probably true at other places with seasons, winter days aren't always good for landscape photography. Now I’m a huge fan of winter, with its landscapes of pillow-like snow, skiing, and snowshoeing! A fresh snow has a beauty all its own, and a winter wonderland is a stunning thing to photograph! But eventually, the snow gets stale and crusty. It begins to melt, revealing the brown landscape underneath. The lakes are icy and unreflective while the shores are muddy. These are the kinds of days that can be frustrating to photograph. They might be better days to stay indoors and do other things. But, I will always love being outside, regardless of the conditions. Most of us are not going to photograph great images every day, but getting outdoors is good for the soul. It’s also good for practicing photography. Try to find the best composition despite uninteresting subject matter and drab colors. Strive to get better with using the camera as an instrument, to expose properly, and to take multiple photos to combine later in post-processing. And hone the eye to look for the least ugly subject and most pleasing composition. Because if we can practice now, it will come in handy when it counts. Like any good craftsman or artist, practice is necessary, especially for those of us who do not possess pure talent.. Even if you find it hard to photograph on certain days, bring the camera anyway, and just walk around. Notice nature. Look at the trees and the rocks, and see what angles they would look best. Notice where the light shines on the hills and the valleys during the course of the day. Imagine what the scene would look like in the Spring or the Autumn and remember to come back then. Take several reference photos. But no matter what, you are outside, and it’s hard to have a bad day when you are outside.